Gary Marbut isn't aiming to eliminate federal gun laws. He just wants to make them much less relevant. Marbut, president of the Montana Shooting Sports Association, is one of the leaders of a new grassroots movement that's seeking to invoke the principle of states' rights -- including states' own authority to regulate firearms -- to thwart what he and his allies view as an increasingly overreaching federal government. Politicians in Washington have "assumed power that many of us believe was not authorized under the limits of the Constitution," Marbut said in an interview with CBSNews.com last week. This modern-day federalist revolt began with a Montana state law recently signed by Democratic Gov. Brian Schweitzer. It says that firearms, ammunition, and accessories manufactured entirely inside Montana are not subject to federal regulation, including background checks for buyers and record-keeping requirements for sellers. They would remain subject to state regulation. The law, which does not permit the manufacture of certain large-caliber weapons or machine guns, takes effect on October 1, 2009. Montana is hardly alone: the Tennessee legislature has approved a nearly-identical bill, and others are pending in Texas, Alaska, Minnesota, and South Carolina. About 10 other states, including Florida and Arizona, are reportedly considering similar measures, and a Colorado state legislator has publicly pledged to follow suit. While this federalism-inspired revolt has coalesced around gun rights, the broader goal is to dust off a section of the Bill of Rights that most Americans probably have paid scant attention to: the Tenth Amendment. It says that "powers not delegated to the United States by the Constitution, nor prohibited by it to the States, are reserved to the States respectively, or to the people." Read literally, the Tenth Amendment seems to suggest that the federal government's powers are limited only to what it has been "delegated," and the U.S. Supreme Court in 1918 confirmed that the amendment "carefully reserved" some authority "to the states." That view is echoed by statements made at the time the Constitution was adopted; New Hampshire explicitly said that states kept "all powers not expressly and particularly delegated" to the federal government. But a series of subsequent court cases have, in the eyes of the federal judiciary, narrowed the Tenth Amendment so it now has little legal force. The states "never gave the federal judiciary permission to erase the Tenth Amendment from the Constitution," Marbut said. "We need to reacquaint them with the Tenth Amendment." "I think they probably should succeed and I think they probably won't," Nelson Lund, a professor of constitutional law at George Mason University who specializes in the Second Amendment, said in an interview, referring to the backers of the gun rights bills. "The Supreme Court has strong precedents that would render this statute invalid." Two doyens of gun rights advocacy agree. David Kopel of the free-market Independence Institute in Golden, Colo., says supporters would be "foolish" to expect to win. Randy Barnett, a Georgetown University law professor, believes the federalism laws won't "stand up to scrutiny" and has been suggesting ways Texas and Utah could amend their pending bills to survive judicial review. Barnett should know: he was a lead attorney in Gonzales v. Raich, in which the U.S. Supreme Court rejected similar claims involving medical marijuana. Angel Raich is a seriously ill patient who wanted to grow her own medical marijuana, which state law permitted her to do. But a federal law that the Justice Department claimed was based on Congress' constitutional authority to "regulate commerce" made it illegal. One possibility is is that the composition of the U.S. Supreme Court has changed enough in the last four years to make a repeat of Gonzales v. Raich unlikely; on the other hand, some justices that might have been sympathetic to a sick mother using medical marijuana may not be as willing to embrace federalism in the form of liberalized gun regulations. Another possibility is that proponents can argue -- as Marbut plans to do -- that this case is different. In Gonzales v. Raich, the Supreme Court noted "it is not feasible to distinguish" marijuana that's "manufactured and distributed interstate and controlled substances manufactured and distributed intrastate." The Montana law, by contrast, says that all state-made firearms "must have the words 'Made in Montana' clearly stamped on a central metallic part, such as the receiver or frame." Marbut says he plans a test case in federal court that would use the example of a Montana resident without a federal firearms license seeking to manufacture a made-in-Montana gun. "We can get this clarified," he said. "I do not want any Montana citizen to face federal prison time." Even though this case is a legal long shot, federalism fans say it's worth pursuing. "It's great PR for us," says Alan Gottlieb, founder of the Bellevue, Wash.-based Second Amendment Foundation. 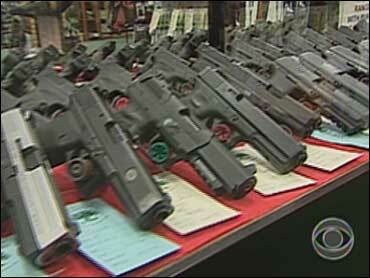 "It's keeping gun owners across the country excited and energized. It's a way of taking the offensive when normally gun owners are on the defensive." The stakes are higher, of course, than just gun rights. If the judiciary somehow breathes new life into the Tenth Amendment, and curbs federal regulation of commerce taking place entirely within a state, that would let states bypass innumerable federal rules on everything from pharmaceuticals to children's toys. "It's a response to federal overreaching," Gottlieb says. "A lot of people supporting this cause couldn't care less about firearms. They don't want the Obama administration dictating what states can and can't do. It's a pushback against federal authority in general." In other words, if the state-by-state efforts to enact laws citing the Tenth Amendment prove to be legally futile, they might still raise the visibility of the topic of state autonomy. And a host of governors signing laws expressing their support for the Tenth Amendment might make the Obama administration view political realities a little differently. Says Lund, the George Mason professor: "To the extent they're working to get people to think for themselves about the Constitution, that's a good thing and could lead to some good results." Declan McCullagh is a senior correspondent for CBSNews.com. You can e-mail Declan at declan@cbsnews.com .